"Freecorder Toolbar” is a browser extension that helps you – as its publisher “Applian Technologies” claims – to download and record videos. "Freecorder Toolbar” program is marked as a browser adware and hijacker program, because installs malicious search engines inside your browser, like “Search.us Search” or “Delta Search” and changes your Internet home page to malicious home pages like “Search.us Home page (start.search.us.com)” or “Delta Search Home page (www2.delta-search.com)” , which perform browsing redirects and display advertisements from unknown vendors. The "Freecorder Toolbar” installer program is bundled inside other free software installation programs and for that reason you must always pay attention when you install free software on your computer. Step 1. 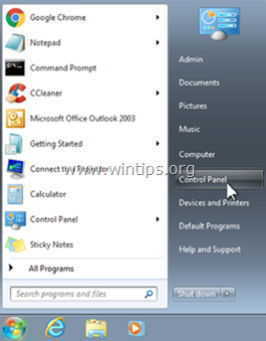 Uninstall applications installed from "Freecorder Toolbar” software from your Control panel. 1. To do this, go to Start > Control Panel. “Programs and Features” if you have Windows 8, 7 or Vista. Step 2. Manually remove “Freecorder Toolbar” & “Search.us” search settings from your Internet browser. How to remove Freecorder Toolbar & Search.us” search settings from Internet Explorer and restore IE search settings. 1. Open Internet Explorer and then open “Internet Options”. To do this from IE’s file menu, choose “Tools” > “Internet Options”. Notice*: In the latest versions of IE press the “Gear” icon on the top right. 4. On “Search Providers” options, choose and “Set as default” a search provider other than “Search.us”. 5. Then choose the “Search.us” and click Remove. 7. Close all Internet Explorer windows and proceed to Step 3. 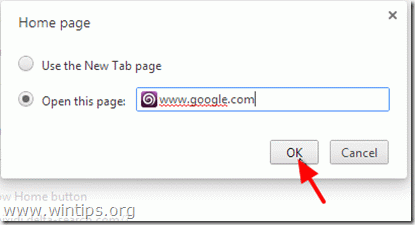 How to remove Freecorder Toolbar & Search.us” search settings from Google Chrome and restore Chrome search settings. 2. Find the "On startup" section and choose "Set Pages". 3. Delete the "start.search.us.com" page from startup pages by pressing the "X" symbol on the right. 6. Delete the “start.search.us.com” entry from “Open this page” box. 7. Type (if you like) you preferred webpage to open when you press your “Home page” button (e.g. www.google.com) or leave this field blank and press “OK”. 10. Then choose the "Search.us" search engine and remove it by pressing the "X" symbol at the right. Choose "Done" to close "Search engines" window. 12. In “Extensions” options remove the “Freecorder” extension by clicking the recycle icon at the right. 13. Close all Google Chrome windows and proceed to Step 3. How to remove Freecorder Toolbar & Search.us” search settings from Mozilla Firefox and restore Firefox search settings..
1. Click on “Firefox” menu button on the top left of Firefox window and go “Options”. 2. In “General” tab delete the “http://start.search.us.com” page from “Home Page” box and type your preferred HomePage (e.g. http://www.google.com). * If “Freecorder” extension exists, then press the “Remove” button in that line. 5. Close all Firefox windows and proceed to the next Step. 4. 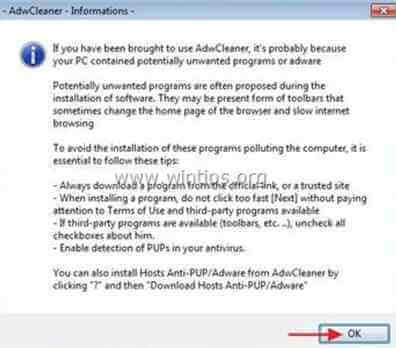 Press “OK” at “AdwCleaner – Information” window and press “OK” again to restart your computer. Step 4. Clean unwanted files and entries. *If you don’t know how to install and use “MalwareBytes Anti-Malware“, read these instructions. Step 6. Restart your computer for changes to take effect and perform a full scan with your antivirus program.